Mouse anti Human CD4 MEM-241. 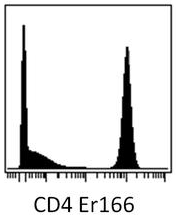 Product is tested for Western blot / Immunoblot, Flow Cytometry. 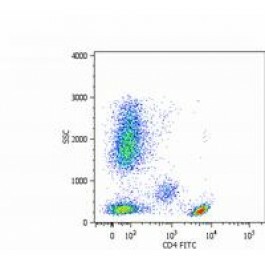 Positive control: peripheral blood, HPB T cell line. 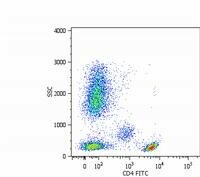 Application note: excellent antibody for FC application. Sample preparation: Resuspend approx. 50 mil. cells in 1 ml cold Lysis buffer (1% laurylmaltoside in 20 mM Tris/Cl, 100 mM NaCl pH 8.2, 50 mM NaF including Protease inhibitor Cocktail). Incubate 60 min on ice. Centrifuge to remove cell debris. Mix lysate with non-reducing SDS-PAGE sample buffer. Application note: Non-reducing conditions. CD4 is a co-receptor involved in immune response (co-receptor activity in binding to MHC class II molecules) and HIV infection (human immunodeficiency virus; CD4 is primary receptor for HIV-1 surface glycoprotein gp120). CD4 regulates T-cell activation, T/B-cell adhesion, T-cell diferentiation, T-cell selection and signal transduction. Defects in antigen presentation (MHC class II) cause dysfunction of CD4+ T-cells and their almost complete absence in patients blood, tissue and organs (SCID immunodeficiency). Millán J, Cerny J, Horejsi V, Alonso MA. CD4 segregates into specific detergent-resistant T-cell membrane microdomains. Tissue Antigens. 1999 Jan;53(1):33-40. PubMed PMID: 10082429. Zola H, Swart B, Banham A, Barry S, Beare A, Bensussan A, et al. CD molecules 2006--human cell differentiation molecules. J Immunol Methods. 2007 Jan 30;319(1-2):1-5. Epub 2006 Dec 4. PubMed PMID: 17174972. 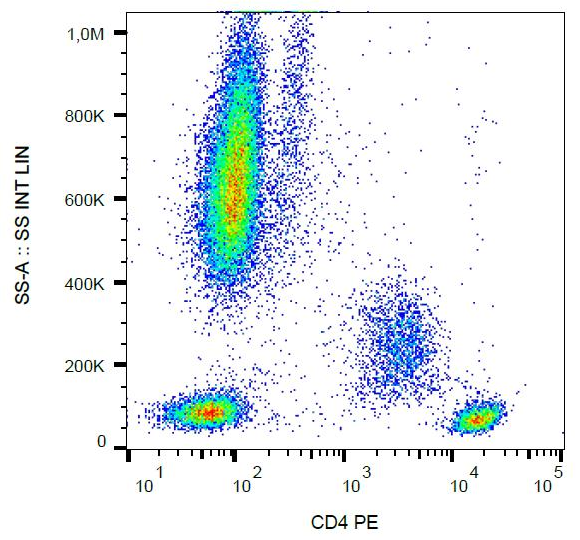 The antibody recognizes CD4 antigen, a 55 kDa transmebrane glycoprotein expressed on a subset of T lymphocytes (helper T-cells) and also on monocytes, tissue macrophages and granulocytes.